Non Prescription Swimming Goggles in three colours. Supplied in a hard case. 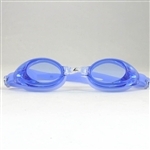 Quality adult swimming goggles in two colours. One size fits all. Either Plano or Prescription. Choose your power or if unsure follow the directions below. If you wear distance contact lenses then choose the same prescription. If you enter your distance spectacle prescription at the checkout we can send you the closest power. Works on the best vision sphere principle so they are a good approximation of your prescription. To work out which power you need add the sphere and half of cylinder value together from your prescription, Eg -4.00/-1.00x90 = -4.00 + -0.50 = -4.50D. Or +1.00/+0.25x35 = +1.00 + 0.12 = 1.12 Closet power is +1.00D Each eye will be the same power so contact us to confirm if you are not sure. Swimming goggles made to your distance prescription. In three colours. Also available as non-prescription. Adult & Junior available.